Who knows Rick Steves? Last night, Jordan and I were watching Rick Steves’ travel show–he’s a guy from the Pacific Northwest who makes sense for me of Jordan’s family living half in North Dakota and half outside of Seattle, Mr. Steves’ accent has strong Midwestern undertones, and his boisterous nature reminds me of my brother-in-law. Rick traipses around Europe with his camera crew, giving travel advice and showing off the great sights. 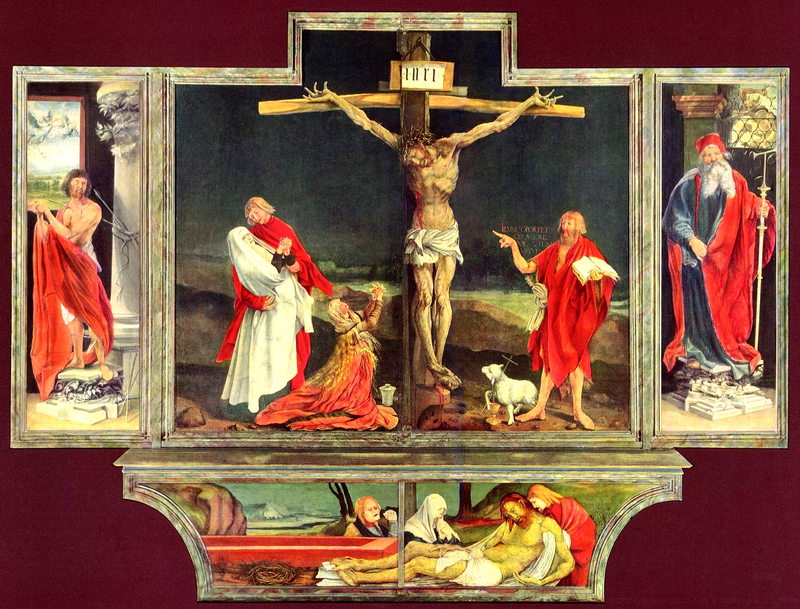 We watched an episode he filmed in a French town named Colmar, where there’s a really beautiful piece of art, the Issenheim Altarpiece. It’s been one of my favorite artworks since I learned about it a few years ago. In our reading from the book of Acts today, we hear the words of the two angels, “this same Jesus, who was taken from you into heaven will return the same way you’ve seen him go into heaven.” (Acts 1:11) This same Jesus. The same Jesus who has been appearing to the disciples the last forty days, who has nail marks in his hands, who suffered right next to his followers and those he healed–that human person is also God–he has been as close to people as he possibly can, and now he goes back to his Father, as our Gospel lesson puts it (John 17:1-11). Jesus, who sits with us in our sufferings, who knows what it is like to be human, is brought to God the Father, to draw us even closer too. Through Jesus, we are made closer to God, brought ever more into God’s presence. And what are Jesus’ last words to his followers as he is taken from them? “You will be my witnesses in Jerusalem, and Judea, and all Samaria, and to the ends of the earth.” (Acts 1:8) This verse is a sort of summary or table of contents of the whole book of the Acts of the Apostles–it’s the account of the early church’s development from Jerusalem, which is the first few chapters, out to all Judea which is the few chapters after that, and into Samaria–a wider reach than Judea–in the chapters following, and headed to the ends of the earth–to the edges of the known world in the first century–by the end of Acts. But you know what? We’re at the end of the earth too–here in Columbia, South Carolina. This is our story. This is our mission, to be witnesses to God’s work in our lives through Jesus Christ. We are called to be witnesses, to talk about how God has change our lives, right here in Columbia. Last week, Jordan and I went to see my brother graduated from college in New York City. We had some extra time the night before the graduation, so we went to dinner with a friend of Jordan’s who is also doing his graduate work, and lives in the City. I’d met him once, three years ago, and though he’d been married almost two years, neither of us had yet met his wife. It could have been a really awkward dinner–with us really not knowing each other well at all–but they were such holy, open people, we started talking about what God was doing in our lives within fives minutes. You’re thinking, “that’s what a couple of preachers do!” aren’t you? Well, as the husbands were getting dinner ready in the kitchen, this new friend of mine told how God had been leading her in a very clear, specific direction in the last six months; I got into this business because I love to hear what God is up to in peoples’ lives, so I asked her how this happened, how did she know that God was speaking to her, directing her? She told me about walking home from church one Sunday with her husband, talking as they always did, and soon the conversation turned, and as he asked her questions to help discern what she was thinking and feeling, it dawned on her all at once what she was meant to do. And she cried, right there outside in the middle of Manhattan (of course, it was Sunday morning, so there weren’t many witnesses). I started to tell her how it was that I was called to be a priest; but I didn’t tell her the story I usually do–you see, I have two stories. One is about how I was doing a lot of reading and thinking and reflecting and talking the year I worked after undergrad, and how a conversation with my mentor became an “ah ha!” moment–but that’s not really when I knew, that’s not really when I was called. The story I hadn’t told anyone except Jordan until that night was from earlier on; the summer I graduated, I lived in an apartment, and I was lying in bed one night–I’d just received my first Book of Common Prayer from amazon.com (I don’t recall what possessed me to buy one, but I did), and as I shut the book and lay there, clearing out my mind to go to sleep, the thought floated right into my head–like that game you play as children, pretending an egg is cracked on your head, with the innards oozing down your hair, into your mind–and like a flash, I knew it was true, “You will be a priest.” The realization made me gasp, and then cry, and then I fell asleep. My new friend put it well, she said something like, “when you come face to face with Truth, what can you do but cry, and submit?” There aren’t good words for what happened to me that night as I was falling asleep, or what happened to my friend as she was walking down the street. They were moments beyond the realm of the explicable. Which takes me back to Rick Steves. At another moment in his travelogue last night, Rick was at the Louvre. He was describing the Realist movement, the style of painting in the mid-1800s which sought to portray scenes as accurately as possible. Many artists got quite good at this, studying light and details, using paint to make what looked like a photograph–there are plenty of them featured at the famous Parisian museum. Then along came the Impressionists, who not only let their brushstrokes show on their “finished” canvases, but eschewed this idea that paintings should look like photographs all together. They favored, instead, to use paint to give life to a scene–like Renoir’s depiction of a cafe in Paris, where you can almost hear the people talking, the music playing, and the dancers’ feet tapping. The sense of movement and life captured in Impressionists’ work continues to amaze and delight. They knew there was more to life than the bare facts, the scientific and certain lines and boundaries of a body or an instrument or a street scene. Impressionists captured wind and breath and emotions in a way that Realists never could, a way that science and sociology and anthropology never can. Today we celebrate the Ascension; next week is Pentecost, and then we spend the next several months in Ordinary time. Nothing to interrupt us, nothing to catch us off-guard, nothing to jazz up the green vestments and altar-hangings, from here till December. But isn’t a lot of life that way? Not just that it’s our longest church season, but that we spend most of our time taking kids to school, making dinner, going to work–banal, common, ordinary stuff (of course, the church season “Ordinary” means “counted”–not “common,” though perhaps it should). Our challenge is to witness to Jesus’ work in our lives, to notice God in the common, ordinary, everyday things. Then again, what was my experience going to sleep at night back in that apartment in Durham, North Carolina, and what was my friend’s experience walking back from church with her husband, except ordinary and common? Jesus meets us in the ordinary and the common, Jesus finds us and stays with us in our suffering and in our “normal;” God is eager to reveal himself to us in the everyday. We have only to watch, and then to witness; even if it is an experience that is more of an Impression than Realism. This entry was posted in beauty, sermons and tagged art, John, Pentecost, Realism, Rick Steves, witness by Emily. Bookmark the permalink.